I’ve been asked about Kik Messenger before during programs (mostly by parents) over the last couple years. It’s one of those apps I’ve never paid much attention to because I have no use for it. With Kik being this week’s topic, I went about my normal methods of learning about the app. Unlike last week’s post about Omegle, I’m less inclined to issue a straight up warning against the app. Instead, I think parents just need to understand the ins and outs of the app and come to their own conclusion about whether or not their kids should be using it. So what is it? Kik Messenger is an instant messaging application for mobile devices. The app utilizes a phone’s data plan or available wi-fi to allow the user to send messages without having to use their phone company’s messaging plan. It can be used on smartphone platforms as well as app-enabled devices like tablets and iTouch. The app allows users to send text messages as well as pictures and videos. I decided to take the hands-on approach to this week’s app and downloaded it to my phone. The first thing that struck me as odd were the number of reviews for the app. To give you an idea of what I mean- I compared Kik Messenger’s number of reviews to that of equivalent messaging services. 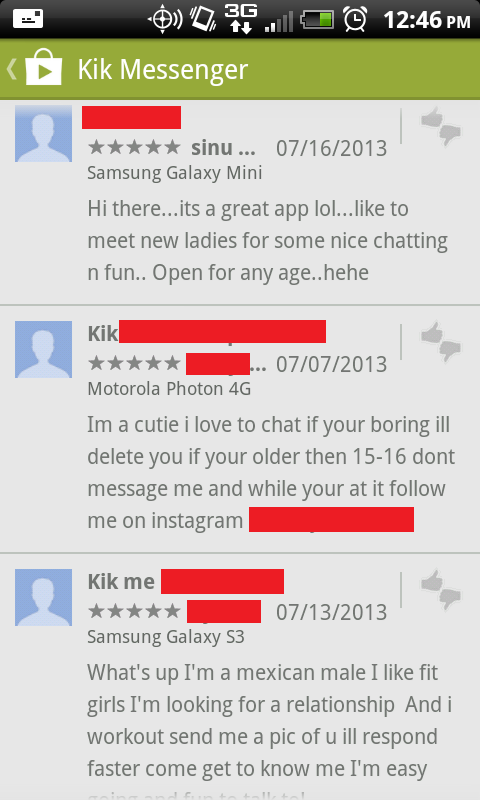 Others averaged around 200,000 reviews, Kik had just under a million. The reason for this made itself very clear right away. Users were posting their Kik names in the reviews and asking people to get in touch with them (see the pictures below…these are the tame examples. Click to enlarge the image). 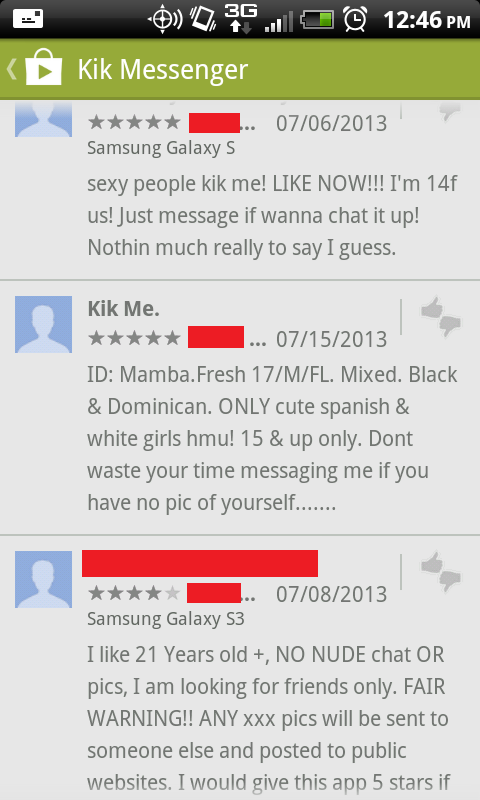 Kik is another sad story about social apps gone wrong. Meant to be used as an inexpensive way to chat with friends has turned into a breeding ground for sexting and other problems. That’s not to say that everyone using it has ill intentions, it just means that parents should be very aware of what their kids are using the app for. The most personal thing the app asked for was my name and e-mail address and, as far as I can tell, there is no way to search for a user with this information. With that in mind, it’s important to note that the only way anyone would obtain this information is if another user gave it to them. Is Kik Messenger safe? Yes- it’s a safe as long as users are smart. In terms of whether or not your child should be using the messenger, that’s entirely up to you as the parent. Setting guidelines for the appropriate use of technology is important and making sure you are upholding the rules that you have set. There add ins you can load that allow you to hookup with others. This app is 17+ for a good reason. Kids should not be using this app.